The Psychologist app is a free download for iOS and Android. Society members get complete access: simply log on with your Society web log in (email and password) at the prompt. Then tap in the top left corner three times to take you to your editions. The app will include monthly editions, plus the occasional special. It looks great on the iPad! The app is a good way to access our content on the go. And on our site, you can view our articles, news, reviews etc in HTML and PDF form. But perhaps you prefer to see it as it appeared in print, but with the benefits of being in digital form? In that case you can access the current issue and an archive via Issuu. Using this version you can zoom, search, use hyperlinks and more. Issuu also has a free app on the Google Play store and the Apple store. Please note that some features work better on some devices than others, but Issuu are continually developing their service. We would also stress that we make The Psychologist available this way as a little bonus; it is not a core part of our online offerings, we cannot be held responsible for how this third-party platform works, and we reserve the right to remove this channel at any point. See 'other versions' below for an alternative way of accessing a 'digital edition'. Please also note that we make the full magazine available in this way to members only, via this link in the members’ area of the Society website. The Psychologist is a key member benefit, and its future depends in part on keeping it that way, so we would ask you not to share the link with non-members (who can get access to a preview version via the same site). Up until May 2016, The Psychologist was available to buy through the Amazon Kindle Store, but Society members could access it for free here. We have now discontinued this service, due to resource issues and lack of demand. We advise you to make use of our app instead, or download the PDF versions via the Society's shop. If you feel we should reinstate this service, your feedback is welcome. 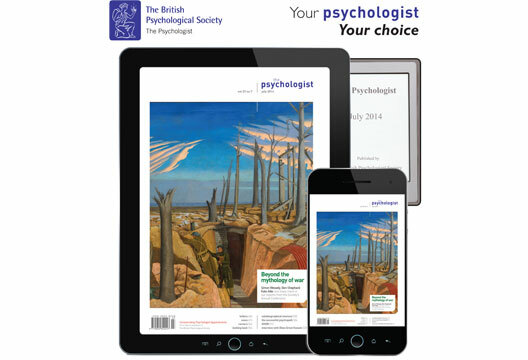 Society members can also download a free PDF of each issue via the BPS shop, and access individual PDFs and html versions via The Psychologist website. This is all great, can I opt out of getting the hard copy version? If you wish to opt out of receiving The Psychologist in hard copy, you can do so by e-mailing [email protected]. However, please note that due to the way our mailings currently operate, you would miss out on receiving certain other information from the Society in hard copy form. Also, don't think you're saving the planet by doing this: The Psychologist is printed on 100% post-consumer waste anyway, and until really significant numbers of members opt for digital there is very little environmental or financial impact. For all e-versions, check back at the beginning of each month, follow us on Twitter for regular updates, or ensure your e-mail is on your membership record so that you receive the monthly 'From The Psychologist' update. We do have some options for the visually impaired. We can send you a Word doc version, to be used with a screen reader; and we produce an audio CD of highlights each month, which you can request by emailing [email protected]. If you have any feedback on these options, please e-mail the Managing Editor via [email protected].